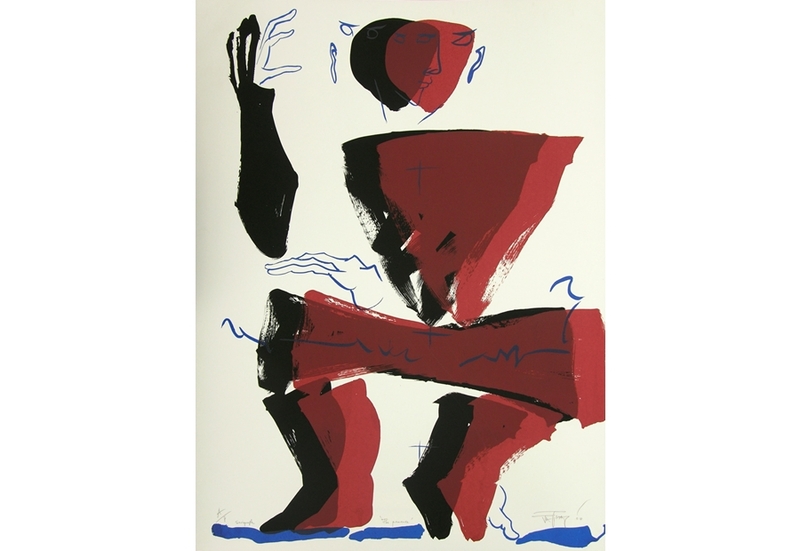 Medium:Serigraph on Paper in 3 colours. Edition of 100. >Jatin Das was born in 1941. He has completed his education in 1962 from Sir J. J. School of Fine Arts, Mumbai. He has held many solo exhibition including: 2010-11 'Hand-held Space', Museum Gallery; Gallery Art and Soul, Mumbai, 2009 The Artists Alley Gallery, San Francisco, USA, 2009 Chelsea Arts Club, London, 1976 Kumar Art Gallery, New Delhi, 1975 Gallery de Sfinx, Amsterdam, 1975 Commonwealth Institute Art Gallery, London, UK, 1975 Schloss Bellevue, Kassel, West Germany, 1975 City Museum and Art Gallery, Birmingham, UK. He has participated in many group exhibition including: 1982 ‘Moderene Kunst Heute’, Museum of Modern Art, Darmstad, Kunsthalle, West Germany, 1980 Contemporary Paintings in Miniature Format, Lalit Kala Akademi, New Delhi, 1979 All India Exhibition of Prints, Chandigarh, 1979 Asian Arts Exhibition, Fukoaka Art Museum, Japan, 1978 National Gallery of Modern Art (N.G.M.A) Collection, Warsaw, Alleppo, Damascus, Narodini Gallery V, Loden, Prague, Cultural Centre, Niavaran, Budapest. The multi-faceted Jatin Das has been a part of the Indian art scene for more than four decades, with his paintings, murals and sculptures. The human body holds an endless fascination for him and he pursues his quest for dynamic figures tirelessly, using a linear structure and quick brushwork. The man-woman relationship, in particular, with all its attendant pain and joy is a constant source of inspiration to him. He has been also involved with art institutions, in several capacities: as a teacher at the College of Art, New Delhi, and at the National School of Drama, New Delhi; as a consultant for the Handicrafts Board, and for the Folk Art Museum, Orissa, to mention a few of the positions he held. In 1991, the Lalit Kala Akademi held a retrospective of his works. In his career, spanning 40 years, Das has held only 37 exhibitions, as he believes that painting is an intensely personal experience, the results of which cannot always be shared with others. In 1965 he won The Bombay Art Society, Governor's Award and Best Modern Painting of the Year, Mumbai and the Maharashtra State Art Exhibition, (Award), Mumbai. In 1976 at the National Show of Portraits, he won an Award from All India Fine Arts and Crafts Society (AIFACS), New Delhi and in 1992 won an award at the IV, Bharat Bhavan Biennale of Contemporary Indian Art, Bhopal. In 2007 he was conferred the D.Litt. (Honoris Causa), Utkal University of Culture, Bhubaneswar: the Bharat Nirman Award and Order of the Star of Italian Solidarity Italian Government, Italian President Award, New Delhi. In 2012 he was awarded Padma Bhushan by the Government of India. He lives and works in New Delhi.